Fabulous………that's you! Every action you take, every petition you sign and every penny you give makes a huge difference to vulnerable lives. From Italy and South Africa to the USA and the UK, thank you for fighting farm animal cruelty wherever it exists. Early next year, a critical vote in the European Parliament could be the first step towards much needed legislation to protect Europe's farmed rabbits. Ahead of this vote we want to put EU decision makers back in touch with their childhood ideals and persuade them to act with compassion. But we need the help of Europe's children. 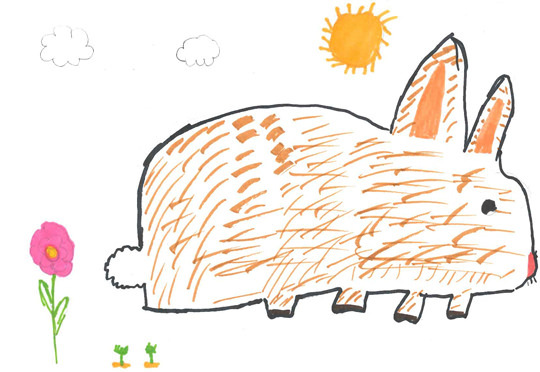 If you've not already done so, please send a drawing from a child you know. Help show an MEP how rabbits ought to live. Thank you to everyone who has donated in response to our campaign against the shameful cruelty that is going on in Italian factory farms. Working closely with our Food Business Manager in Italy, the first Italian food service company, Camst, has committed to stop using caged eggs by 2025. Great news for Italy's hens, as Camst produces 100 million meals a year for schools, hospitals, company canteens and restaurants. And there's progress for Italy's rabbits too, as CIWF Italia hosted a meeting of farmers, scientists, retailers, ministry officials and meat producers to forge a path towards a better future for millions of Europe's most vulnerable farmed animals. Thank you to everyone who asked their MP to help change archaic legislation that means UK public ports can't refuse live exports. The UK Parliament vote has now been postponed until March of next year. We'll keep you updated and let you know how you can help closer to the time. Meanwhile, Compassion is supporting a Europe-wide coalition to improve animal welfare during transport. We've had an indication that the UK government also backs a change to European legislation. Add your voice to Stop the Trucks. McDonald's is extending its cage-free movement even further around the globe. We're delighted that McDonald's South Africa is moving to cage-free eggs by 2025, following similar commitments adopted by many of its international counterparts. McDonald's SA is one of the first fast food restaurants in South Africa to make the cage-free pledge. If other restaurants follow suit, this could be the start of a revolution for South Africa's hens! In a major milestone, global food service giants Compass Group and Aramark have committed to better living conditions and healthier, slower-growing breeds for every chicken in their US supply chain by 2024. There is still much to do, but, thanks to you, the Better Chicken Initiative has come a long way since farmer Craig Watts first lifted the lid on chicken factory farming in the USA! Got everything you need this Christmas? Why not help the billions of farm animals that need you this holiday season. Ask friends and relatives to donate to Compassion instead of a gift using JustGiving and we'll fight in your name for a better future for animals. Thank you for your fabulous support. You are part of a powerful movement that will put an end to factory farming. PS Looking for ways to make your Christmas feast compassionate this year? Click here for our handy festive hints.